I think about a world to come where the books were found by the golden ones, written in pain, written in awe by a puzzled man who questioned, "What are we here for?" All the strangers came today and it looks as though they're here to stay. -David Bowie "Oh! You Pretty Things"
About a month ago, I spoiled the fun of my good friend Rodney. He was unfortunate enough to be celebrating something that I had an issue with. As a good friend, I made sure to put a stop to it. Rodney was excited at the return to the DC universe of black comic book character Black Lightning. I want to emphasize that he's black, because I wasn't sure that you would pick up on this fact by hearing only the character's name. 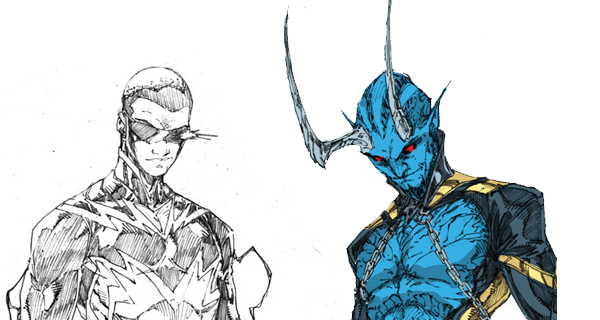 As of October, Marc Andreyko will be writing a mini-series for DC Universe Presents revolving around the unlikely team-up of Black Lightning and Blue Devil. "If Black Lightning is so important to DC," I spewed at my unsuspecting buddy, "then why does he need to share a title with someone else instead of getting his own story? And on that token, why is he only given a short run in DC Universe Presents as opposed to his own title?" Rodney fired back that sharing the title doesn't necessarily mean that Black Lightning can't hold his own. Rather, he suggested, and I agreed, the combination of "Black and Blue" could lead to a really entertaining and endearing sort of supernatural buddy cop drama, starting with how apart these characters are and ending with what can be accomplished if they can put aside their differences. As a fan of Rush Hour and the quintessential Schwarzenegger comedy Red Heat, I thought I would give DC a chance to do Black Lightning right. The second thing to come out of this discussion was a commitment between Rodney and I to write a series of blogs that serve as a State of the Union for black characters in comic books made by the two major publishers (and also Spawn, at Rodney's request, which I will not be able to comment on for lack of experience with the character). Today, I want to talk about three DC comics that feature black main characters: Green Lantern Corps, Mister Terrific, and Voodoo. I think I should warn you that there is likely to be minor spoilers in these descriptions. In Green Lantern Corps #1, Peter J. Tomasi follows the lead of Grand Morison's Superman in Action Comics by making his main characters, Guy Gardner and John Stewart, concerned with down-to-earth issues of social justice. Guy is volunteering with an Earth football team as a coach and John shows an unswerving devotion to ethical practices in the construction of a building. This is John Stewart's introduction into the new DC universe. Since his re-inception, John Stewart has proven to be one of the most psychologically complex characters enveloped in one of the most morally confusing stories in the newly reformed DC universe. You see, in Green Lantern Corps #6, John Stewart is put into a position where the only way to safeguard the access codes to the Oan defense network, to protect the Guardians, the Green Lantern Corps, and everyone who benefits from the Green Lantern Corps, is to murder fellow Lantern Kirrt who shows a weakness of will after being tortured for hours. For some time, people have proclaimed John Stewart as the weak link in the Green Lantern chain. He's been described as emotionless and inconsequential, and writers can't seem to make anything of him without focusing on the fact that he failed to prevent the destruction of the planet Xanshi by an avatar of the Anti-Life Equation in the Cosmic Odyssey mini-series. But Tomasi depicts Stewart as the quiet, long-suffering type, a man who is concerned with the good of all people, but also with the difficult details of being a soldier. In many ways, he's a better role model than the other Lanterns: he's not a hothead (Guy), he's not depressed all the time (Kyle), and he doesn't fly off half-cocked into harms way (Hal). In the person of John Stewart, we are forced to entertain the question, "Does DC believe that a black character can carry his own book?" If any character could, it would be John Stewart. But Guy Gardner is a much more prevalent main character in Green Lantern Corps, and the book is often dedicated to the stories of Lanterns from other planets who have nothing to do with these two. Even if we give DC a break and say that this is a fantastic buddy cop book that shows the power of dynamic between two very different heroes, there remains the fact that Hal Jordan has his own book (Green Lantern), Kyle Rayner has his own book (Green Lantern: New Guardians), and Guy Gardner is featured in two books (Green Lantern Corps and Justice League International), while John Stewart is only the co-headliner of the GL comic that is dedicated to little more than setting up for multi-book crossovers. From issue one, Mister Terrific is identified as the third smartest person on Earth. (My bet is Lex Luthor and Ray Palmer are one and two.) As such, Mister Terrific becomes a fantastic role model for children. He's a strong black character made relevant since Grant Morrison had a chance to work with him, and I think he's someone that a black boy could be happy to dress up as for halloween. Add to this the fact that the book is scribed by a black writer (Eric Wallace) and tackles difficult historical issues like the idea that slave traders, when confronted by pirates, would drown their slaves rather than see them liberated (Mister Terrific #5), and you have a really fantastic comic book with a black main character. Of course, for all of this to be true you have to ignore the fact that Mister Terrific was cancelled almost immediately after it was conceived. As one of the first casualties of the new 52, Mister Terrific lasted for a measly eight issues. Does this mean that DC hates black creators and characters? I'm not ready to jump to that conclusion just yet. Eric Wallace had some time to tell a couple of interesting stories, but one cannot ignore the fact that he jumped in too fast. Mister Terrific #1 bombards the reader with a complex history in which the title character experiences the death of his wife, the appearance of a son that never was, meddles with science, runs a business, plays the superhero, and hangs out with Karen Starr (Power Girl), whose first appearance into the new DCU seemed to overshadow any other positive talk of Mister Terrific on the comic book message boards. Some might say that Mister Terrific was a half-assed attempt at resurrecting the success of Grant Morison's run on the book, citing the inclusion of other Morison properties such as Animal Man, Frankenstein Agent of S.H.A.D.E., Batman and Robin, and Batwing as evidence. But this ignores the fact that Eric Wallace is a talented writer who really seemed to care about his cast of characters. You can call me a conspiracy nut, but I think the fact is that DC never intended for this title to be anything more than a mini-series. Much like the Huntress limited series, Mister Terrific was a good idea turned into a cheap setup for Earth Two and World's Finest. The future of Mister Terrific hangs in a bittersweet balance. He goes from the main character of a minority-written comic to a member of a team on another earth where DC is allowed to be a little more risque. (After all, do you think DC would have the balls to make one of their Earth One heroes gay like they did with Alan Scott? I think not, even though my friend Chad made a good case for a gay Kyle Rayner and I would have no problem with DC re-introducing Donna Troy as a lesbian Amazonian.) On the one hand, sending a character to Earth Two is kind of like turning them into a bench warmer. But on the other hand, James Robinson may do Mister Terrific a lot of good with his concern for history and justice in the foreground. Voodoo was panned from the beginning of the new 52 (like Starfire in Red Hood and the Outlaws and Judd Winick's Catwoman) for its portrayal of women as sexual objects. The unfortunate side-effect of this negative press is that it completely overshadowed the fact that the first arc of Voodoo, written by Ronald Marz and illustrated by Jared K. Fletcher, featured an interesting story, beautiful artwork, and some fantastic character development. I'm not certain why Marz was replaced by Joshua Williamson in issue five. It probably has to do with the fact that not a lot of people were reading Voodoo. But everything about the title went downhill: the story became one-dimensional, the characters lost their depth, and the art wasn't enough to carry the book. I can't blame Williamson too much. After all, he was joining a failing title in the middle of the development of its story, and at DC the only thing that could breathe that much life into a title that doesn't feature any heavyhitters like Batman, Superman or Green Lantern would be to get a big name like Alan Moore or Joss Whedon on the book, and that isn't what happened. Is Voodoo an example of a positive black role model? I don't really think so. First of all, she's not even really black. Voodoo is an alien who has taken on the appearance of a human. Her black facade is a front, an illusion to keep her hidden from her foes. Second, I am really tired of the idea that a black woman must be in some way tied to the concept of voodoo. Certainly, the concept of magic in the South is a part of the story of black people in America, but it isn't the story of all black women in America, and it's not even a story that is limited to any people of any particular skin color. In the end, none of this is important, because Voodoo is yet another black character whose comic was axed by DC comics. Sure, she made it through the first wave of cuts, but after issue zero we're not likely to hear from her again.